One of the keys to a successful and efficient dust collection system is the use of a properly sized inlet transition. This piece of duct work connects the main trunk line to the inlet of the dust collector. When a properly sized transition is used, the velocity inside the main trunk line duct is reduced enough such that a majority of the larger and heavier dust particles in the airstream will drop out into the collection hopper without collecting on the filter bags. This allows for longer bag life, a lower pressure drop, and generally a more efficient dust collection system. The proper inlet transition to use is sometimes referred to as a "pelican" transition. It is a round-to-rectangle transition with the top side of the duct straight and the bottom side at a 15° slope downward. This type of transition allows sufficient time for the air to slow down as it enters the dust collector. There are other types of transitions such as those having two sloped sides. These do not perform as well as the pelican type since the length of the transition piece is usually half of the size of the pelican style which does not provide enough distance to sufficiently slow the airstream down. 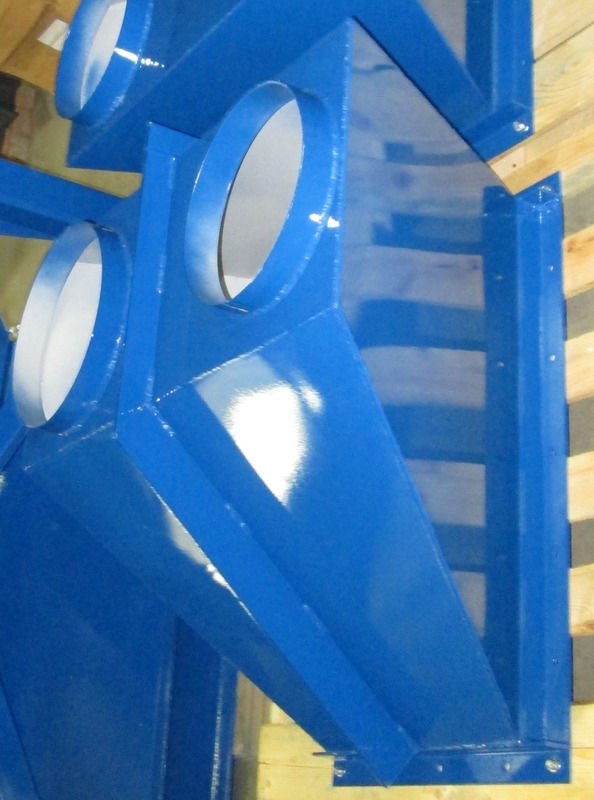 At SDC, we can engineer and manufacture an efficient, custom, and heavy duty inlet transition for your specific dust collection system. By using the correct inlet transition, you will ensure that your installation will be both efficient and effective.